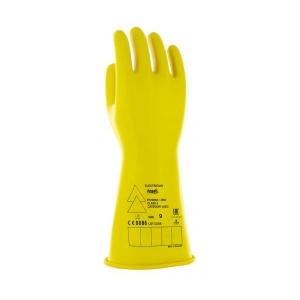 Designed primarily to protect the hands of electricians at work, the Ansell E016B Electrician Class 0 Long Black Insulating Rubber Gloves are ideal for providing hand protection for a wide range of applications. They provide flexibility and dexterity with 100% natural rubber latex, as well as preventing hand fatigue with an ergonomic and non-splayed design. The product code for the gauntlet gloves is: E016B. If hands become fatigued, or if they move more slowly to avoid any posed threats that could cause harm or skin irritations, then a job can both take longer and become increasingly more dangerous. The E016B gloves will protect your hands and wrists while also reducing the risk of hand fatigue with the hand-at-rest shape and non-splayed fingers, allowing them to perform their best for longer. The E016B gloves have been constructed from 100% natural rubber latex using a proprietary environmentally friendly dipping process. They provide excellent flexibility and dexterity, ensuring that hand movement is not severely restricted while working. The Ansell Electrician E016B Gloves are available in a choice of sizes, making them suitable for most users. Please consult the table below for details, then select the required size from the drop-down menu at the top of the page. The Gloves have a thickness of 1mm and a length of 360mm. 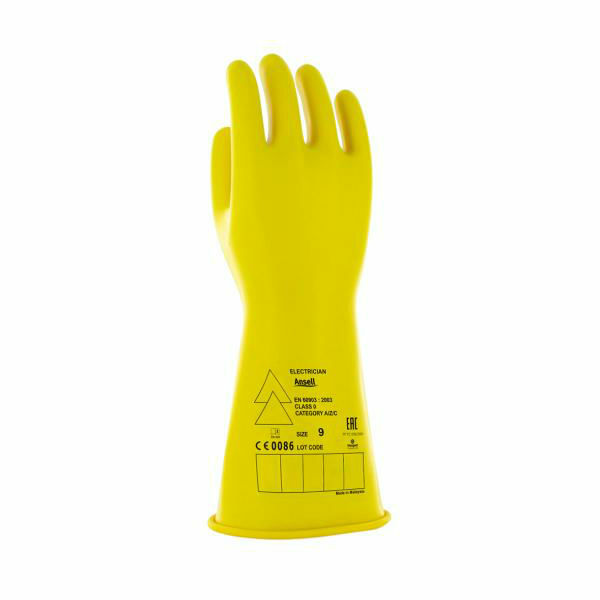 Please note that, while the image displayed shows the glove in a yellow colour, this product includes two gloves in the colour black only.